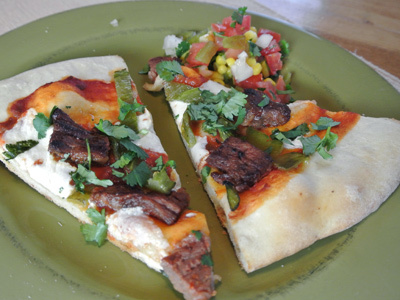 A few years ago California Pizza Kitchen had a steak pizza on the menu that had seasoned steak and green chile. 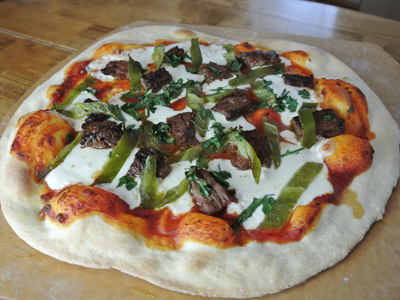 It was my favorite pizza with a thinner crust, spicy tomato sauce with freshly roasted chiles and seared steak. No longer available, I decided to make my own version. The perfect sauce would have been Rotel tomato sauce, but turns out it’s been discontinued too, can’t find it anywhere. Oh Rotel . . . how could you, I loved that sauce and used it for many of my recipes, what to do now? I had to find an alternative which I did after a trip to the Mexican market. 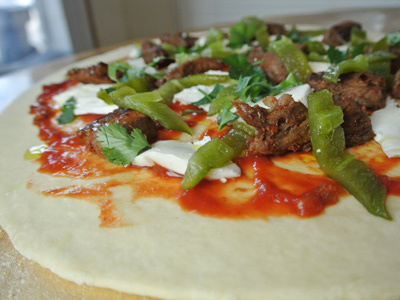 In the end it all came together with a new thinner crust that had a light crunch in every bite and tasty pieces of seared steak and roasted chiles. It’s definitely a keeper and staying on my menu! 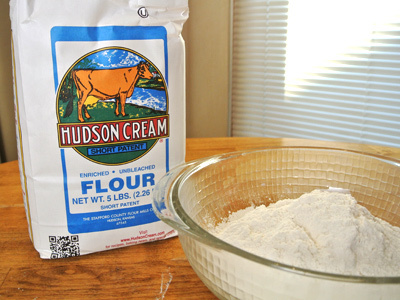 To make the dough I found a new flour that is milled right here in Kansas. 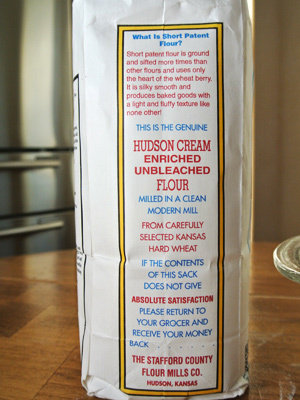 It’s a “Short Patent” flour which is sifted more times than other flours and uses only the heart of the wheat berry. I found it to be much finer and have a silky texture, somewhat like cornstarch. I don’t know if it was the recipe or the flour but the dough was much more elastic and easy to work with. The final crust had more crunch and was really good. You’ll need about 3 cups of flour to make 2 pizza’s. Using the stand mixer I mixed together the water, yeast, sugar, salt and olive oil. Once it sat long enough for the yeast to ferment I added the flour a bit at a time using the dough hook to make the dough. It took a little bit longer to mix in all the flour than in my other pizza dough recipes. Be patient, it is well worth it. Once it formed into a ball, I transferred it to a bowl drizzled with olive oil and placed on top of the stove (with the oven turned on low) to rise. Takes about 1 1/2 hours. In the meantime I’m going to roast the chiles. One for each pizza. These can be roasted on top of an open burner or in the oven on the broiler setting. If broiling, turn every few minutes until the chiles are blistered over all sides. In just a couple minutes the chiles are charred and ready to steam. Place them in a plastic bag and seal for 20 minutes. Then peel under running water. 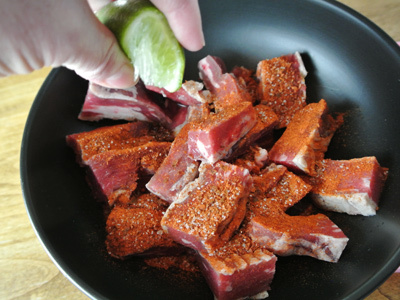 The skin will slide easily off the chile. Remove the stem and seeds and slice into strips. 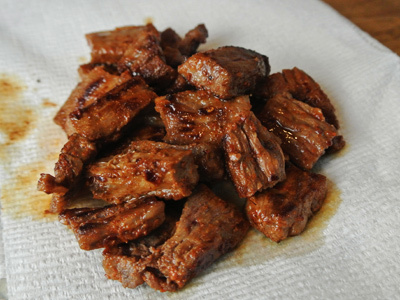 You can use whatever steak you want, I had a small skirt steak in the freezer that I cut into chunks. I made a seasoning mix of red chile flakes, cayenne pepper, paprika and salt. A splash of lime juice makes it even more tasty. Sprinkle the seasoning over the steak and spritz the juice of 1/2 lime. Let marinate until time to sear. Drizzle some olive oil in a hot cast iron pan and sear the steak a couple minutes on each side. In no time the steak is perfectly seared and ready to top on your pizza. Ok, so I’m disappointed that my favorite Rotel tomato sauce isn’t an option anymore. 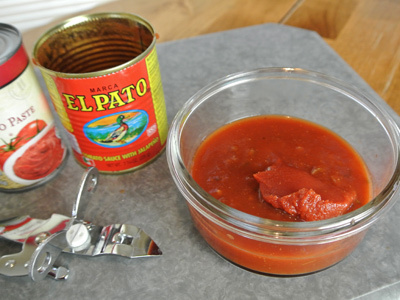 I tried the El Pato tomato sauce with jalapenos and it’s a bit spicier. It was thin and needed a bit of thickening so I added a tablespoon of tomato paste which did the trick. The dough is ready to go after warming and rising on top of the stove. I divided the dough in half and placed each half on a pizza peel. 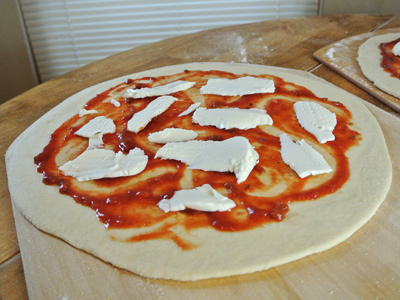 Sprinkle some flour over your peel and begin rolling out the dough. This dough was very elastic and easy to roll. 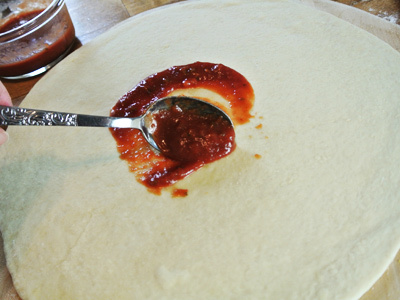 Spread about 1/4 cup of sauce over each pizza . I’ve found if I spoon the sauce too close to the edges it may run over so I try to give it a good inch around the edges. I would like to try some Mexican melting cheese next time but I have fresh mozzarella on hand so that’s what I’m going with. It really is the perfect melt! 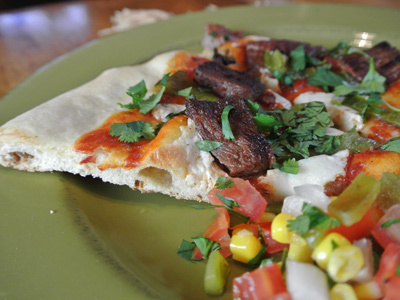 Divide the steak and chiles and place half over each pizza. I thought a little chopped cilantro would be good too. I preheated my oven to 500 degrees and popped in the pizza stone for a good 30 minutes before transferring the pizza’s to the oven. The hot stone makes the pizza cook very quickly and makes for a crispier crust. Look at how the crust just bubbles up. This went for 10 minutes. I made some pico de gallo with corn to go on the side. 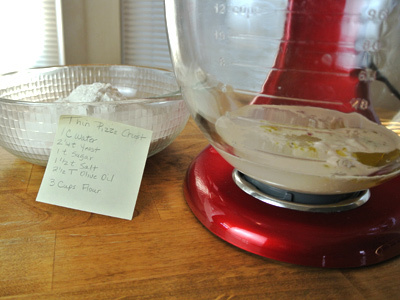 To make thin pizza dough: Combine water, yeast, sugar, salt and olive oil in the mixing bowl of a stand mixer. Let sit for several minutes until the yeast begins to ferment, then begin adding flour a little at a time, mixing after each addition. Continue to blend in the flour until the dough forms into ball. Transfer dough to a large mixing bowl and drizzle with olive oil. 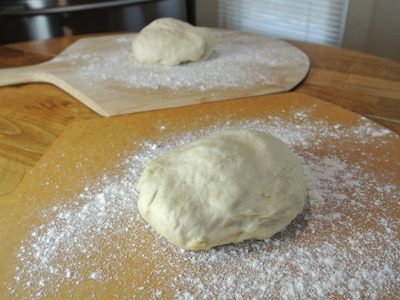 Place dough in a warm place to rise and cover bowl with a kitchen towel. Let sit about 1 1/2 hours to rise, it should double in bulk. Combine 1/2 cup of tomato sauce and 1 tablespoon of tomato paste. Set aside. Combine seasoning mix and sprinkle over steak. 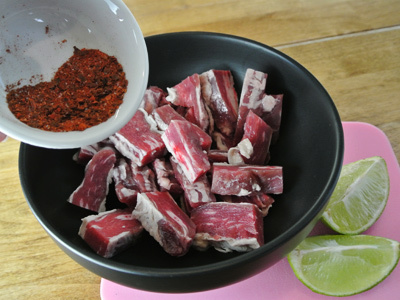 Spritz lime juice over steak and marinate for 20 – 30 minutes. 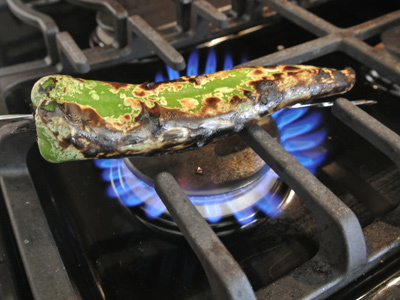 Roast chiles over an open flame of a gas burner or roast at the highest broiler setting. 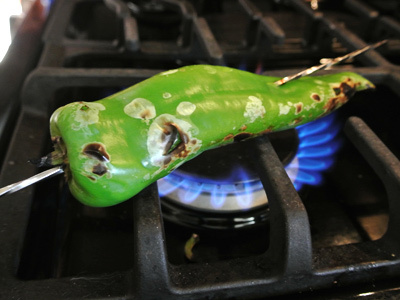 If broiling, rotate chiles every few minutes to blister on all sides. 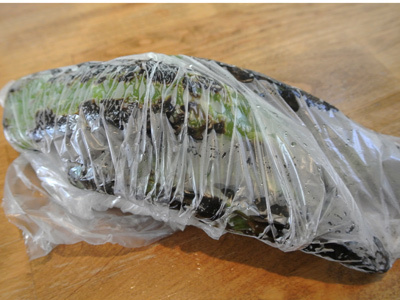 When chiles have blistered or charred on all sides, place in a plastic bag to steam for 20 minutes. Place chiles under running water to peel. Once peeled, stem, seed and cut into strips. Heat a cast iron skillet and add a drizzle of olive oil. 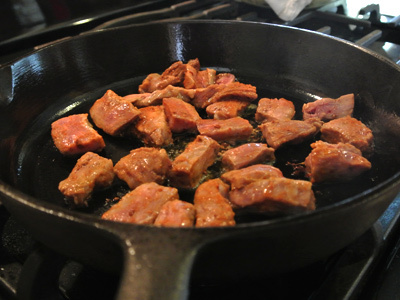 Place steak pieces single file in the skillet and sear 2 minutes on each side. Remove to a plate lined with a paper towel. 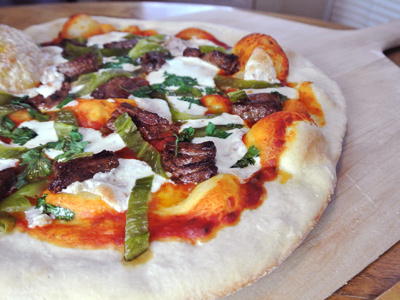 When dough has doubled in bulk, dust 2 pizza peels with flour and divide the dough in half. Place one half on each peel and begin rolling out 12 – 14 inches. When you have the pizza rolled out to about the size you want, sprinkle some cornmeal underneath the dough for easy transfer to the pizza stone. 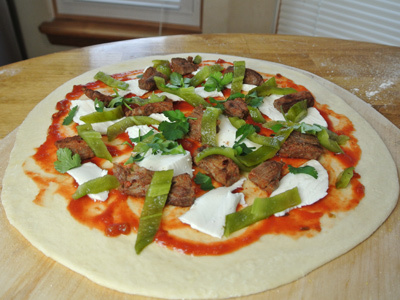 Begin layering each pizza with half of the tomato sauce, mozzarella cheese slices, steak and green chile. Sprinkle a little cilantro over top and drizzle with olive oil. 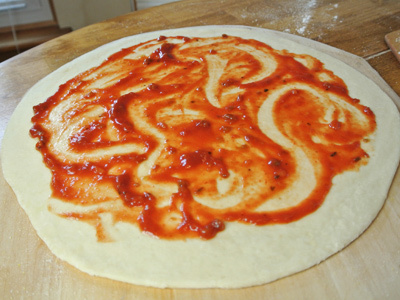 Transfer pizza to hot stone in oven and bake for 10 – 12 minutes or until dough is crisp and sounds hollow when tapped.